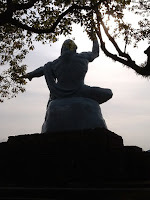 Every now and then in my travels around Nagasaki Prefecture you come upon a special place that instantly makes a strong and lasting impression on you. Umegae Sake Brewery is just one of these places and as a result of this positive and uplifting experience we intend to make this location a regular attraction on our full day tours. To tell you the truth, for quite a few years now, I have been intending to visit this location and highlight its wares but for some reason it never did fit neatly into my schedule on the day. Luckily a few hours opened up for me and my original plan had to be changed, however the god`s shine on me and my chance to check out my first Sake Brewery in Nagasaki came to fruition. The rest is history! Right from the beginning the friendly ladies welcomed me with open arms (not figuratively) allowed me to wander around on my own device, allow me to ask a multitude of questions and to basically give me full access of their facilities in order to make this report. Even though I was here for only 45 minutes or so, it felt so much longer as there was some much information that i was able to digest and use. Unfortunately there is not a huge amount of written and spoken English in this environment but the warm hearted smiles and manners of all the staff members really hopes to overcome any language communication difficulties. I was not able to drink on the day (zero drinking and driving policy in Japan) but the range of Sake (Japanese Rice Wine) Shochu (Japanese Distilled Spirits) and Liqueurs is more than enough to satisfy everyone`s requirements. So I am absolutely sure that I will be back as a non driver to sample at my hearts content in order to be the best guide and provider of information on the day. It`s a hard job but I am sure I can handle it! 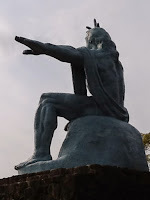 The 26 Martyrs Museum was built on Nishizaka Hill in Nagasaki, Japan in June 1962 to commemorate the 100th anniversary of the canonization by the Roman Catholic Church of the Christians executed on the site on the 5th of February 1597. Its interior is reminiscent of a church with stained-glass windows, making for excellent viewing of the exhibits. On display are artifacts related to Christianity in Japan, including old documents, statues and jewelry. 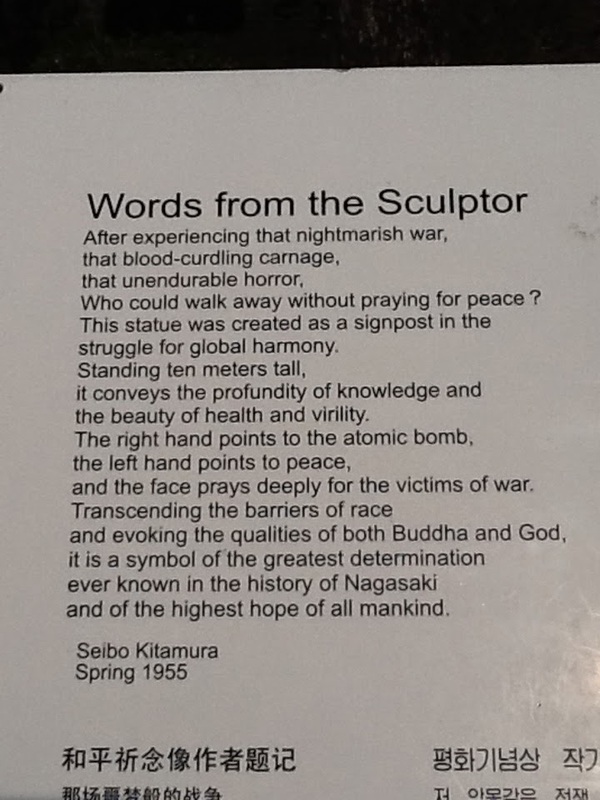 Explanations of many of the pieces are in English and give the viewer an upclose look back at many of the hardships and challenges were placed on the Nagasaki Christians in the 16th and 17th Century. As with most of my stories and investigations into all things Nagasaki, it took me about 8 visits to the actual 26 Martyrs Monument before I stumbled upon this gem of a museum. It doesn`t even get close to half of the visitors that the Atomic Bomb Museum but each corresponding visit by yours truly has opened another angle or targeted wave of investigation into a never ending story of the Nagasaki Hidden Christians. Well worth a visit and worth every penny of its 500 yen entrance fee. 1 or 2 hours of your time can be used up with ease at this location. The Nagasaki Peace Park Main Statue is usually only viewed from one angle, that being from a straight on view but I decided to take another approach and see it was a different viewpoint. A quick little walk around the back of the statues really does offer a completely opposite visual reference. 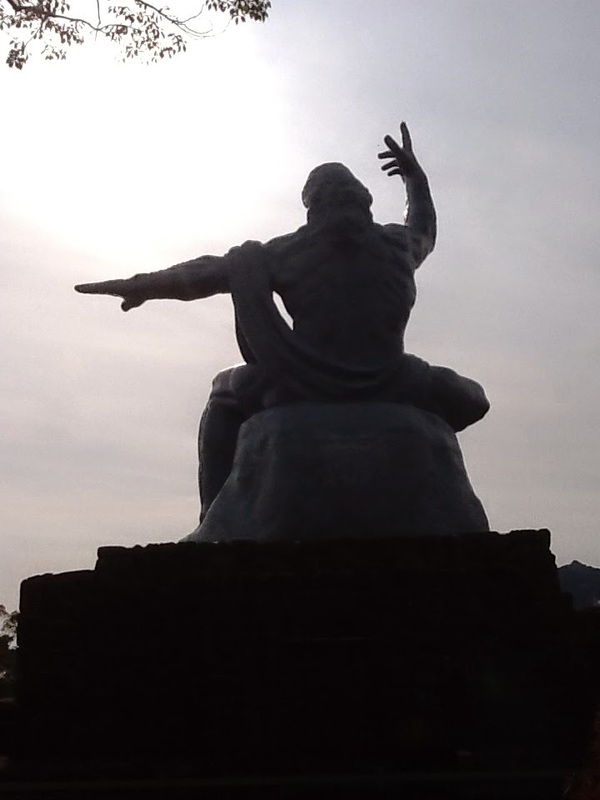 Of course the normal view of the Nagasaki Peace Park main statue is a powerful one, undeniably a moving experience and packed with sorrow but at the same time hope for the future. 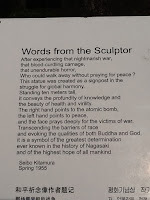 The reverse side however holds all the above but also in addition there is a feeling of doubt that mankind and humanity can actually learn from its mistakes and not go down that narrow windy path of devastation that the nuclear arms race has headed in the past and still does to some degree in this age of the 21st century. I am not sure if these feelings creeped up on my from my subconscious or whether it was because of the positioning of the sun and the dark images that resulted in my feelings of doom and gloom but it is something that we all should and need to feel once in a while to face reality to keep everything at face value and in check. A special and important place for everyone to visit in their lifetime. Henna in Japanese refers to the meaning of strange or different. Therefore it is evident that the designers and architects of this unique place have definitely achieved their intended result. It is quite evident that the Henna Hotel is not a normal hotel in any sense of the word, each step and turn will surprise you with the maximum effect. It actually is quite surprising that there aren`t more of these types of hotels in Japan and around the world! In fact, the company who implemented the 1st fully robotic hotel here in Huis Ten Bosch, Nagasaki have 2 fully functioning hotels in Tokyo and many more are planned throughout Japan and probably the world. At the front desk, you will be greeted by multi-lingual robots that will help you check in or check out. At the cloakroom, the robotic arm will store your luggage for you. Mechanic yet somehow human, those fun moments with the robots will warm your heart. Furthermore, once you register your face with our face recognition system, you will be free from the hassle of carrying the room key around or worrying about losing it. Not only has this robotic technology freed up training and hiring staff but the technologies that have been implemented such as automatic lighting, face recognition, energy usage and wastage prevention not to mention the use of all natural and latest superior building materials to fit in with the concept of the Dutch Theme Park, Huis Ten Bosch which means House in the Woods. Both times I have been to the Henna Hotel I have either been too early or too late to get the check in and check out process on video. I am sure my next visit will get this necessary and interesting part on video.